During late September and early October the region of extremely low ozone values was centered on the geographical pole between 85°S and 90°S. The geographical extent of the ozone hole region, the area within the 220-DU contour, reached a maximum during the first week in October at a near-circular area covering 24 × 106 km2 reaching to the southern tip of South America. This approximately matched the 1992 area record. 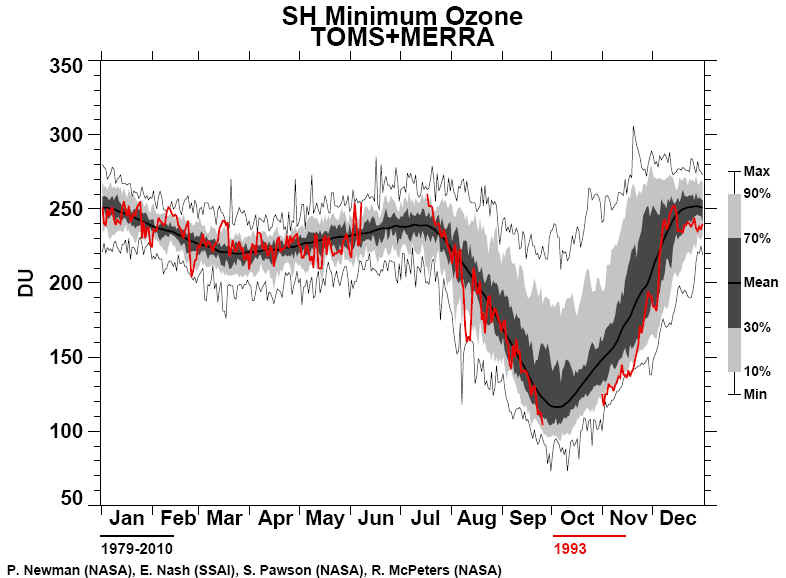 After the maximum area was reached in early October, the 1993 ozone hole region was significantly larger than during 1992 throughout the remainder of the month of October. The very low ozone values over the Antarctic continent have been confirmed by independent ground-based data. 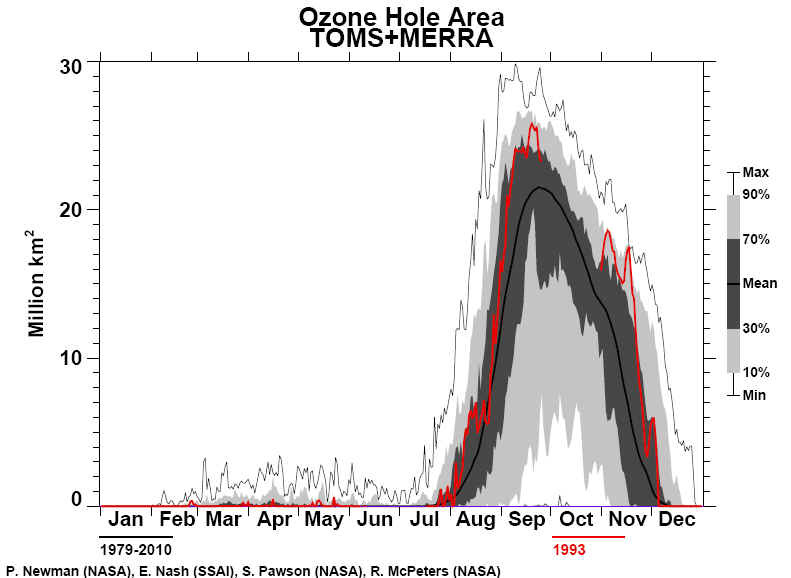 Unlike 1992, the formation of the 1993 Antarctic ozone hole does not coincide with unusually low ozone values observed over most of the globe for the past 2 years. 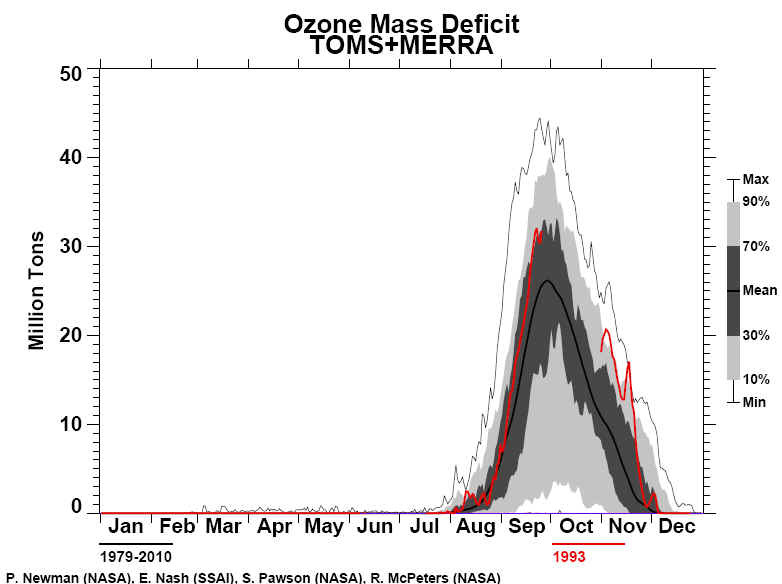 The most recent ozone data from Meteor 3/TOMS show that there has been a recovery at all latitudes from the extraordinarily low values observed during 1992 and part of 1993 after the June 1991 eruption of Mount Pinatubo. Meteor 3/TOMS is described and compared with Nimbus 7/TOMS during the 1991 to May 1993 overlap period. Observations of the 1992 ozone hole are presented from both instruments and are shown to agree within 5 DU. British Antarctic Survey summary 1993-Preliminary ozone values from the British Antarctic Survey Faraday station (65 south, 64 west on the coast of the Antarctic Peninsula) show running average ozone values dropping from around 280 DU at the begining of September to around 200 DU at the month's end. There is considerable day to day variation. Data from our long term record for the station indicate normal values of around 330 DU for this period (with a range of 280 DU to 380 DU). This year's mean September ozone value is 245 DU, giving a reduction of about 25%. The minimum September daily mean value of 142 DU on September 28th is the lowest ever recorded at Faraday (next lowest 145 DU in 1992). 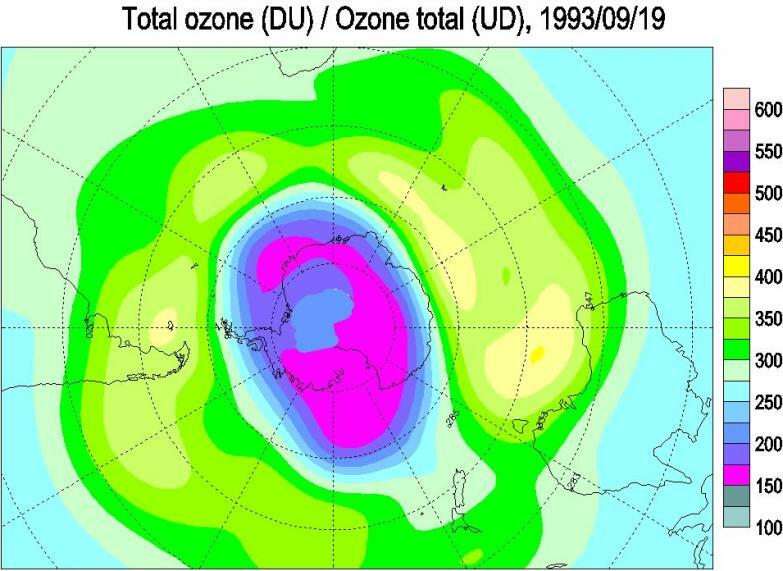 Preliminary ozone values from the British Antarctic Survey Halley station (76 south, 26 west on the Brunt ice shelf) show mean ozone values dropping from around 210 DU in early September to around 110 DU in early October. Data from our long term record for the station indicate normal values of around 300 DU for this period (with a range of 260 DU to 340 DU). This year's mean September ozone value of 159 DU is the second lowest recorded at Halley (lowest 146 DU in 1992), giving a reduction of around 35%. The minimum September daily mean value of 108 DU on September 30 is the lowest recorded at Halley (next lowest 111 DU in 1992). Ozone levels in early October are the lowest ever recorded with depletion exceeding two thirds. This year's Antarctic ozone hole (1993) is the deepest ever. Scientists of the British Antarctic Survey (BAS) at Halley Research Station in Antarctica have recorded their lowest ever value of ozone, showing that over two-thirds of the protective ozone shield has been destroyed. Less than one- third remains intact, and the depletion phase may not be over for some days yet. BAS scientists at Faraday Research Station, normally near the edge of the ozone hole, have also measured record low values of ozone for their station. The Antarctic ozone hole is an annual phenomenon which has occurred in every (southern hemisphere) spring since the late 1970s. It is caused by the chemical action of chlorine and bromine released from man-made chlorofluorocarbons (CFCs) and halons. 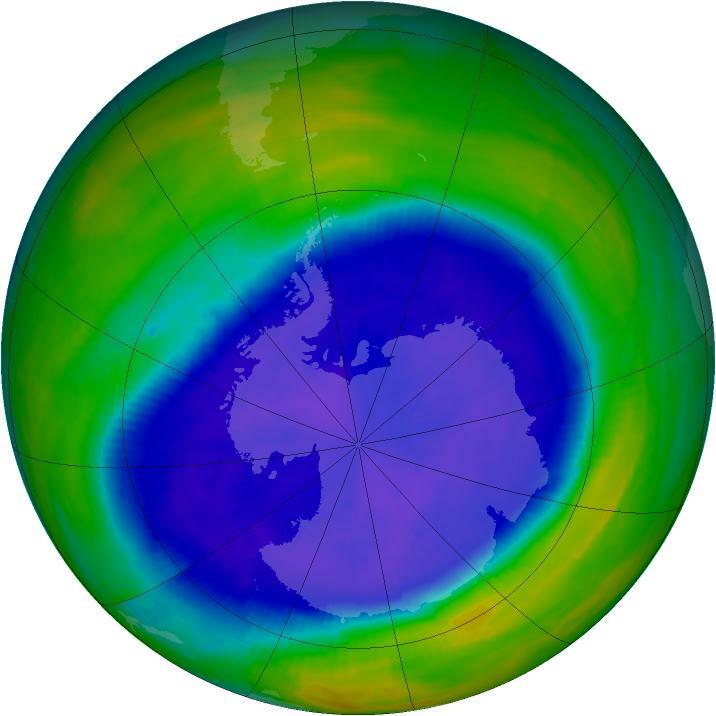 Thanks to the international Montreal Protocol, the annual production of these substances is now less than before, but the total amount in the atmosphere continues to rise, dashing hopes of an early recovery for the ozone layer. The CFCs are not expected to reach their maximum concentration in the atmosphere until around the turn of the century, so the Antarctic ozone hole may continue to worsen until then. BAS scientists have been measuring ozone in Antarctica on a daily basis since 1957. There was no ozone hole at all until the late 1970s. The Antarctic ozone layer is not expected to return to normal until the 2070s.